Wear the helmet of Achilles ( Achilles Trojan Helmet ), ancient Greeces greatest warrior and leader of the fierce Myrmidons! This ready-to-wear helmet is crafted from an actual design used in the Greek city-state of Corinth. 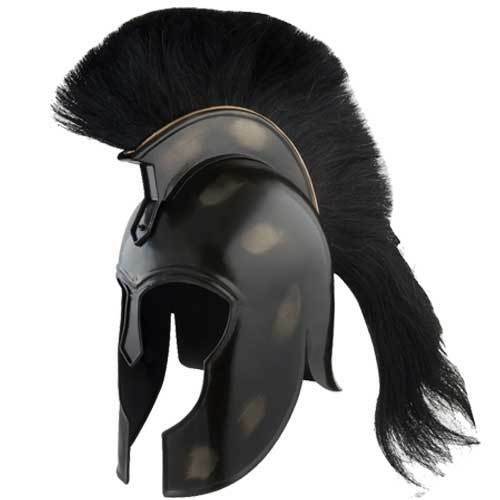 This excellent Achilles Trojan Helmet is hand made from 18 gauge carbon steel with a black finish. At random several areas have an intentionally distressed finish, so each piece is unique in it's own way, and no two are exactly the same. This item includes a removable black horse hair crest, or plume. This is a fantastic item for historical reenactors or serious collectors! Handmade: Size, shape, color, finish, etc may vary.